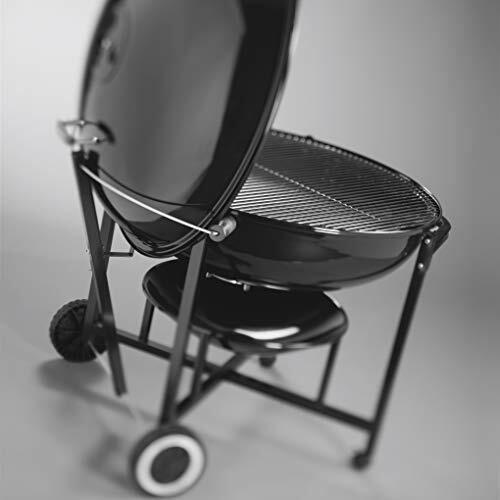 Weber has been one of the most trusted names in grilling since they first emerged onto the scene in the late 1950s. For decades their 22-inch and 26-inch kettle grills were seen as the vanguard for quality backyard cooking appliances. 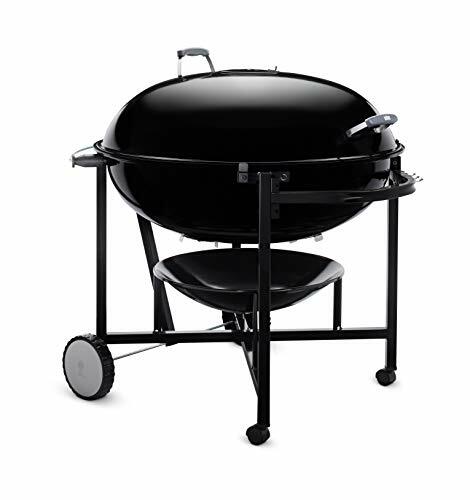 As time has gone on they have expanded into other niches in the grill industry. The Weber Ranch represents a return to the classic simplicity of a charcoal kettle grill, with a nearly industrial high capacity. 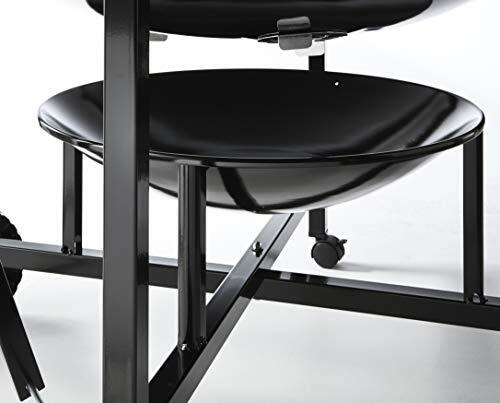 The lid and fire bowl are coated in the traditional layers of thick porcelainized enamel that you find with all of Weber’s kettle-style grills. 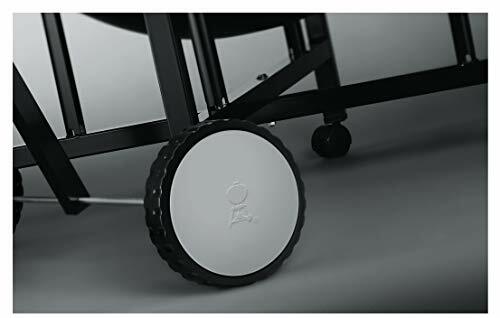 The lid comes with a special “Tuck-Away” holder hook, to spare you from having to place it on the ground. 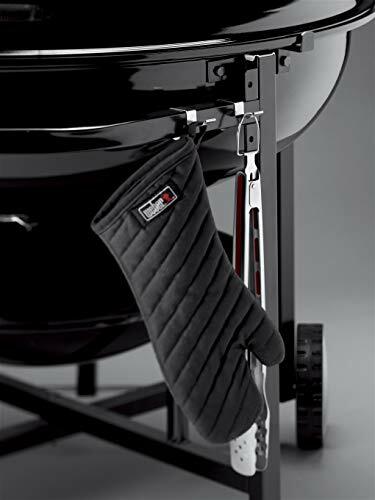 The handles are made from glass reinforced nylon, and it comes with tool hooks to keep all your grilling equipment close at hand. The lid also includes a built-in thermometer. 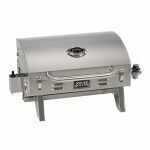 The large 37 ½“ grill grate is made from stainless steel to provide you with a staggering 1,104 square inches of grilling space. It doesn’t have any sort of hinge or sections to it as you might find with other types of grill grates in this class. 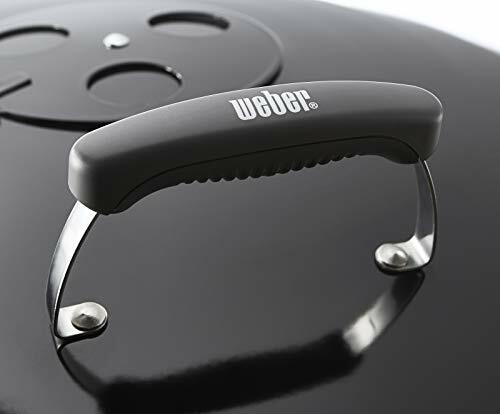 Weber always tries to hang their hat on providing its customers with quality products. This has been a key component of maintaining its large base of loyal customers. If you are a longtime Weber enthusiast, then you will find all the things you appreciate in their smaller, traditional kettle grills. The porcelain-enameled fire bowl and lid, and a sturdy high capacity ember tray. 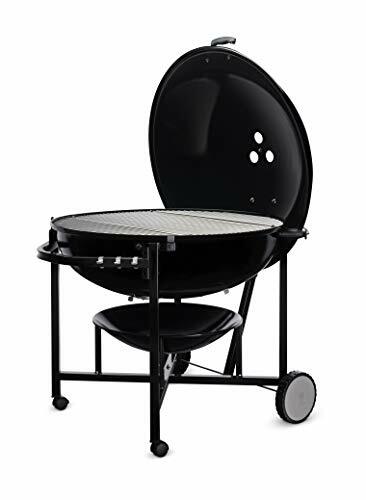 One minor complaint to make with the Weber Ranch is the fact that they used the same kind of stainless steel grill grate that you get with all their other kettle-style charcoal grills. While this stays in the same vein of their “Brand Identity” you sort of expect something a little more special for a grill of this magnitude. 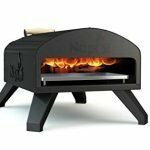 Other grills in this price range tend to be made from cast iron and then coated with a special layer of nonstick porcelain. 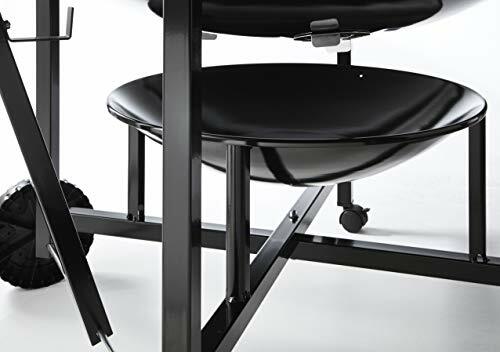 This isn’t the sort of grill you are going to want if you just need to grill dinner for two. It’s the sort of thing that’s meant to grill supper for all the guys on a tour at the firehouse, or for the weekly church social. If you need a high capacity grill to make a staggering number of hamburger patties, steaks, or chicken breasts the Weber Ranch will get the job done. It’s large size also gives you the ability to improvise it as a smoker. To do this you need to set up a hotbed or charcoal on one side of the large fire bowl and place the meat at the other. 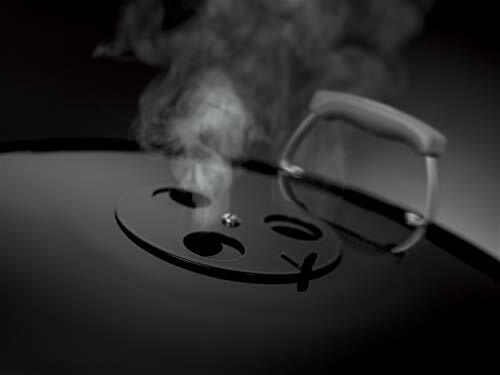 The smoke will then rise up, roll over the domed shape of the lid to perfume and cook the meat with hot smoke. In this setup, the lack of a hinged or easy to lift grill grate can be a little bit of a problem. If it’s going to be a long smoking session, like a brisket or pork shoulders, then it might help to use chunks of wood soaked in water for a day before, rather than wood chips. This will give you longer and more potent smoke to reduce the total number of reloads. The Weber Ranch can also handle what’s known as “Hybrid Grilling.” This is ideal for tougher cuts of meat like chicken thighs or a leg of lamb, that benefits from some slow cooking over low heat to soften up the connective tissue and render some of the fat. The meat can then be moved over a hotter flame in a different area of the fire bowl to sear or give it those visually appealing grill marks. Height under the domed lid can sometimes be an issue. There is just enough overhead space to grill beer can chicken, but even a medium-sized turkey might be very close to touching the lid. The Weber Ranch has a 37 ½“ stainless steel grill grate that provides you with a staggering 1,104 square inches of grilling space. The Weber Ranch can be a bit of a labor to clean. 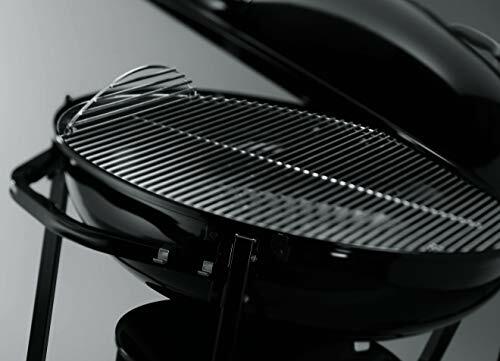 The grill grates are just thick enough that you can still scrape them down with a metal wire grill brush. Yet it can still leave behind a little bit of residual material on the underside of each stainless steel bar. The best way to speed this part of the process up is to keep some steel wool or a scouring pad close at hand. You can then lift the grill grate after scraping the top with a wire brush, then run the steel wool over the underside to clear away any dangling bits. Another issue with the cleanup process is the huge volume of ash that the Weber Ranch can hold. If you have it completely loaded with charcoal, you can expect to be scooping with a metal bucket for quite some time. The Weber Ranch comes with a multi-tiered limited warranty. The fire bowl and lid come with a 5-year, no rust through/burn through. This excludes paint fading and discoloration, which only carries a 2-year warranty. If you frequently need to grill for a large number of people, then the Weber Ranch might be in your wheelhouse. 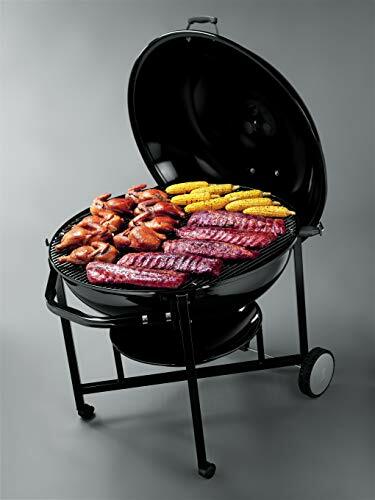 There are few charcoal grills on the market that boasts its impressive number of square inches. 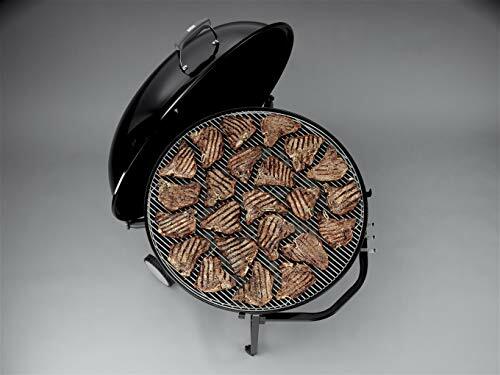 It can be used as a direct fire grill, a hybrid grill or even improvised as a smoker. 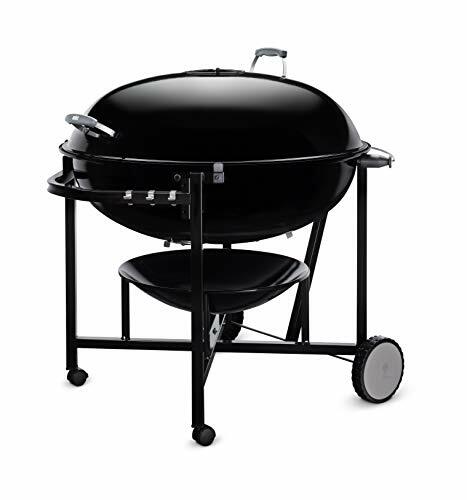 If you only need to grill for a lot of people once in a blue moon, yet you still want something that can grill up supper for your family of two or three, then you might be better off buying two 26-inch Weber kettles and keeping one stored in the garage for special occasions.